Reversible paper wall calendar offers a choice between two convenient formats for yearly planning. 12 month date range on both sides from January - December. Yearly view features unruled daily blocks to highlight key dates and jot down notes. Side 1 is vertical with 1-1/4" x 1-3/8" daily blocks. Side 2 is horizontal with 1-1/4" x 1-1/4" daily blocks. Federal holidays are marked in Red for clear differentiation. Calendar is bright white with Red and Blue ink. Printed on quality paper containing 30% post-consumer waste recycled material. 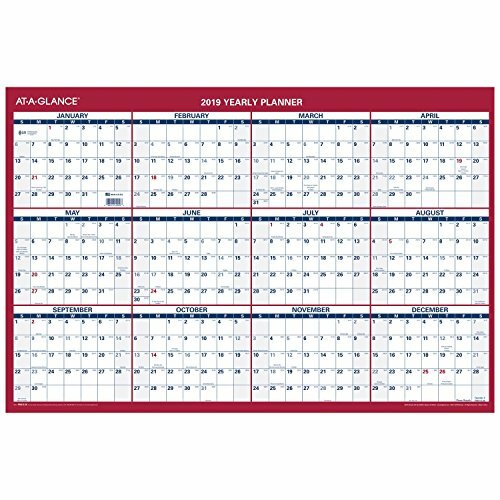 24" x 36" calendar has enough space to track individual or group schedules. Reversible paper wall calendar offers a choice between two convenient formats for yearly planning. 12 month date range on both sides from January - December. Yearly view features unruled daily blocks to highlight key dates and jot down notes. Side 1 is vertical with 1-1/4" x 1-3/8" daily blocks. Side 2 is horizontal with 1-1/4" x 1-1/4" daily blocks. Federal holidays are marked in red for clear differentiation. Printed on quality paper containing 30% post-consumer waste recycled material. 24" x 36" page size.